WASHINGTON, DC (July 25, 2011) — The Reynolds American tobacco company is once again deceiving consumers by running magazine ads that describe its Natural American Spirit cigarettes as 'eco friendly.' This is yet another attempt by a tobacco company to downplay how deadly and addictive cigarettes truly are, this time by marketing a cigarette brand as environmentally friendly. Consumers should not be deceived: There is nothing healthy or environmentally responsible about Natural American Spirit cigarettes or any cigarettes. The new 'eco friendly' ads are running in women-oriented magazines such as Elle, Lucky and Marie Claire, continuing the tobacco industry's long history of targeting women with advertising implying a less harmful cigarette. 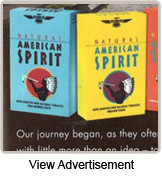 Natural American Spirit cigarettes are manufactured by a Reynolds subsidiary, Santa Fe Natural Tobacco Company. 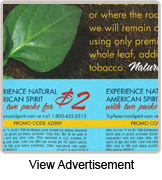 We call on Reynolds American and the Santa Fe Natural Tobacco Company to immediately end this deceptive ad campaign. Natural American Spirit cigarettes are just as deadly as other cigarettes and contribute to the more than 400,000 deaths caused by smoking in the United States each year. Cigarettes also harm the environment. Cigarette smoke spews more than 7,000 chemicals into the environment, including hundreds that are toxic and at least 69 that cause cancer. According to calculations from researchers in this field and published in an issue of Tobacco Control funded by Legacy earlier this year, at least 5.6 trillion cigarettes are discarded into the environment worldwide annually. Cigarette filters and butts are the most common form of litter and are the most common debris item collected from beaches and inland waterways during Ocean Conservancy's annual International Coastal Cleanup, with nearly two million cigarettes and cigarette butts picked up during the 2010 cleanup. Cigarette butts contain heavy metals that can leach into waterways, posing a threat to aquatic life.